Whip up a Cool Yogurt Smoothie in just 5 minutes! Made with COOL WHIP Whipped Topping and fresh strawberries, this yogurt smoothie is super creamy. 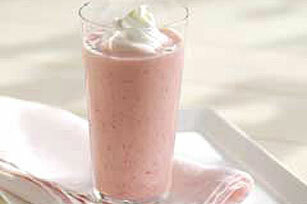 Blend yogurt, 1-1/2 cups COOL WHIP and strawberries in blender until smooth. Pour into glasses; top with remaining COOL WHIP. Serve immediately. Smoothie can be made ahead of time. Refrigerate up to 24 hours, or freeze up to 1 week. Re-blend before serving. If smoothie was frozen, thaw 20 min. to soften slightly before blending. Prepare using your favorite flavor yogurt, regular COOL WHIP Whipped Topping and/or frozen strawberries or any other cut-up seasonal fruit. Prepare as directed, cutting all ingredients in half. Makes 2 servings, 1 cup each.